As lawmakers consider reauthorization of the Higher Education Act, there is sustained interest in creative solutions to address cost concerns and improve efficiency in the student aid programs. To that end, the Bill & Melinda Gates Foundation has generously provided grant assistance to organizations like NASFAA to work, first alone and then collaboratively, to present policy proposals through their "Reimagining Aid Design and Delivery" (RADD) project. NASFAA's work in the first three phases of the RADD project is detailed below. As lawmakers consider reauthorization of the Higher Education Act, the student aid programs continue to face severe funding and efficiency problems. With grant assistance from the Bill & Melinda Gates Foundation through Phase 1 of their "Reimagining Aid Design and Delivery" (RADD) project, NASFAA in February 2013 released a policy brief examining the current systems of student aid with an eye towards reimagining how they could be improved in the future. The report included input, suggestions and feedback from NASFAA members across the nation and other members of the higher education community. Through a second Gates Foundation RADD project grant, NASFAA on March 20, 2014 released a paper, written in conjunction with four other policy organizations, calling on Congress to reform the overly complex repayment process for federal student loans by automatically enrolling all new borrowers in a single income-based repayment (IBR) plan. The recommendations were presented at an event held the same day and hosted by the Committee for Economic Development. The organizations in the Phase 2 consortium included: NASFAA, HCM Strategists, Institute for Higher Education Policy, New America, and Young Invincibles. Through a third Gates Foundation RADD project grant, in May 2015 NASFAA released a paper exploring the potential implications of implementing prior-prior year (PPY). "Great Expectations: Implications of Implementing Prior-prior Year Income Data for the FAFSA" addresses expressed concerns, considerations, and benefits related to implementation of PPY. The paper argues the numerous potential advantages that have surfaced far outweigh the concerns. This paper is one part of a greater consortium with the National College Access Network (NCAN) and the Education Trust to simplify the financial aid process and increase access and success. The recommendations and implications were presented at an event on May 28, 2015 in Washington, DC. 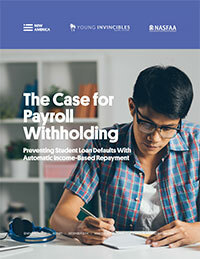 In December 2014, NASFAA released a paper, written in partnership with two other policy organizations, on the issue of employer withholding in an Income-Based Repayment (IBR) system for federal student loans. The paper argues that automatically enrolling indebted students in IBR, and automating repayment through employer payroll withholding, could help to simplify the student loan system for students and radically reduce the number entering default. The organizations in this Phase 3 consortium included: NASFAA, New America, and Young Invincibles, with technical assistance from the Urban Institute and the U.S. Chamber of Commerce.